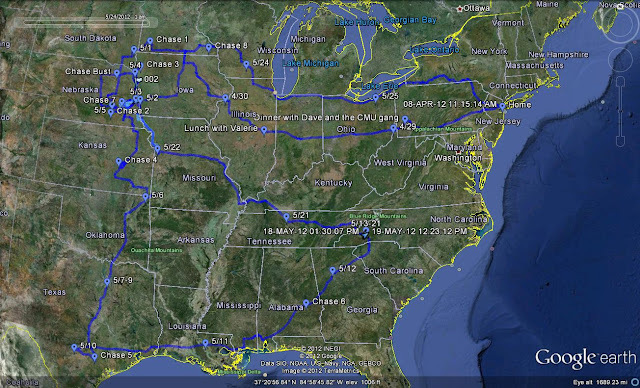 With work on my book, Infocomm, chasing the shuttle, and taking a Cisco certification exam, I haven't had any time until now to write up the storm chasing trip I did in late April and May. But I'm sitting in the Vegas airport now, and have a bit a of time until my flight, so here goes. I've long been fascinated with the power of nature, and a lot of the things I do for fun are related, in some way, to experiencing that power. As a kid, growing up in Maryland, I always loved summer thunderstorms, although in those days (before Doppler radar) they were a mysterious and powerful force. 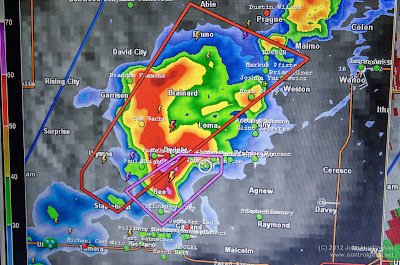 Tornadoes and giant supercell thunderstorms were something I only experienced in the movies or on TV, and they seemed scary and even more mysterious (and I even remember fooling my brother by issuing a phony tornado warning with a wireless mic that transmitted on the FM broadcast band). Over the years, I've experienced as many natural forces as I could; I was even at the ocean in the 1980's as a hurricane made landfall. But, like many people, I first recall becoming aware of people chasing big storms in the plains with the 1996 movie Twister, and I was hooked. In recent years, with affordable mobile internet, chasing has become more accessible, and I went with a pro chaser a few years ago out in South Dakota (where we saw some amazing giant hail storms). That led to me taking two college-level meteorology classes, and being trained as a skywarn spotter. 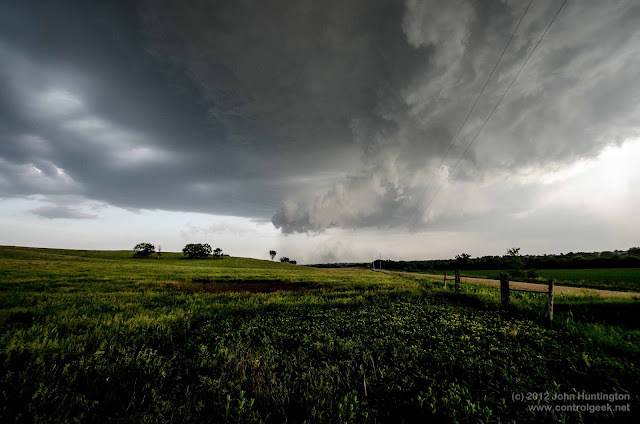 On the east coast, when we get tornadoes they are usually weak, short-lived, and hard to see, and so I have long wanted to go and chase in the plains, where they get more supercells than anywhere else in the world. The problem for me is that May is peak tornado season, when I'm buried in my end of semester final exam hell and can not get away. This spring, though, I was on sabbatical, so this was my one chance for the foreseeable future to chase in the plains during peak season. So, in late April, I headed west to points unknown. I wasn't sure where I was going--I was literally following the winds, and I didn't know when I would be getting back. According to the Weather Channel's excellent severe weather expert Dr. Greg Forbes, this May was 63% below average for tornadoes, and there were less than in any year since the 1970's. So this wasn't the best year to have a once in a lifetime chase opportunity, but it did mean, fortunately, that for the first time in many years there was not a single tornado fatality in May. I'm happy with my photos (they are all printed and on my wall at home now), but I don't think I really captured how truly awesome (and I'm not misusing that word) it is to stand in the updraft of one of these insanely powerful storms. It's eerily quiet, the wind is shifting directions and intensity as the storm moves towards you. It's dark and very foreboding, and there's often lightning and a feeling of impending danger all around. While shooting photos you have to keep an eye on the sky, while watching the radar to see the parts of the storm you can't see visually, and also keep a continuously-updated escape route in a place you've never been before. It's completely engrossing, which I guess why it's such a powerful experience. 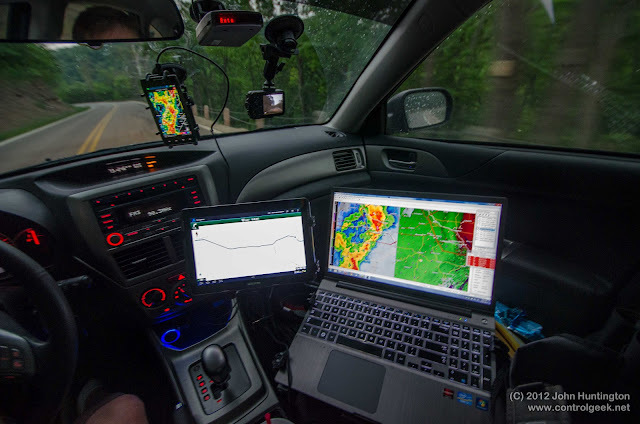 It's also oddly social, since through the use of spotter network, you can see where many of your fellow chasers are, and it becomes a bit of a ritual celebration of nature--chasers spread out up and down empty rural back roads, all staring up at these massive, incredible storms. So in the end I didn't see a tornado, but the only thing that disappointed me about this trip is that I had so few opportunities to shoot big, photogenic supercells. But I feel like somehow, some way, I'll be back out there in the plains, staring up at these awesome storms, standing under that updraft with my camera.